When Barry Segal, made his first visit to Africa in 2008, he made a few observations that would eventually guide the work of the Segal Family Foundation: 1. If given the opportunity and appropriate resources, people in the rural areas of Africa could change their communities for the better. 2. The many NGOs and organizations in Africa were working to solve similar problems but were not collaborating or learning from each other. 3. 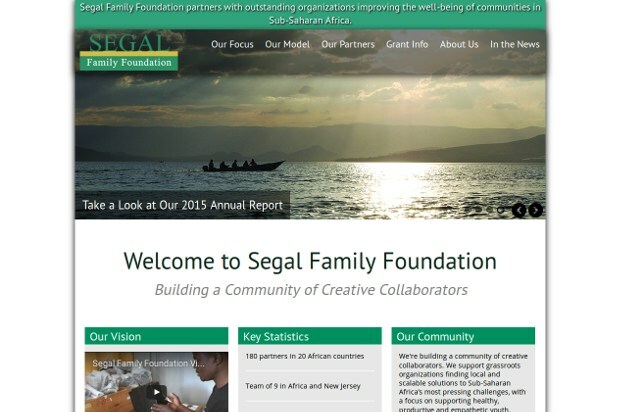 The Segal Family Foundation could make a significant impact on the continent by investing in grassroots projects with talented leaders and smart solutions and by encouraging these organizations to work together. Now, the Foundation is building a community of creative collaborators in Africa. They focus their giving exclusively on Sub Saharan Africa, with over 130 partners in 18 countries and have full-time staff members in Africa. At the heart of their portfolio are their Grassroots partners. They typically offer a holistic set of services (education, health, livelihoods) as they are often located in remote or marginalized communities lacking other quality service providers. These organizations have dynamic and visionary leaders, tend to be rooted in local communities and have budgets usually less than $1m/year. They strive to find rising stars and continue with them as they grow the depth and breadth of their impact. Then, they connect their Grassroots partners with organizations in their Innovators portfolio. These include larger non-profits, for-profit social ventures, and other types of organizations. The common characteristics are expertise in a particular thematic interest of SFF and the willingness to share this knowledge with the Foundation and all their partners. Who will support the young night workers and teenage parents? Who will support the artists?